Lens Description: A masterpiece of innovative optical design, this compact, lightweight, high performance standard zoom (26-78mm equivalent) delivers a fast F/2.8 aperture over its entire focal-length range for maximum creative flexibility. To maintain critical sharpness when shooting handheld it includes VC (Vibration Compensation), Tamron’s state-of-the-art, tri-axial image stabilization system. Three compound aspheric elements, special LD glass, and BBAR coatings ensure superb correction, color fidelity, and freedom from flare. A minimum focus distance of 0.29m (11.4 inches ) offers exciting close-up opportunities. The 17-50 f2.8 non VC is much better coming close to the Nikon 15-55 f2.8 (1329$ non VR) in IQ. See Photozine.de their conclusions and for pics taken with the VC and non VC and the 17-55 f2.8. A few stores sells it now for 399$ cdn + there is a 25$ refund from Tamron. A must have for DX shooters. I had a Tamron 17-50 f2.8 non VC. It’s quality construction and autofocus in non-perfect conditions are poor, but it’s image quality (especially colours) are incredible. I love it. Now I have a canon 18-200 and I think I will buy another 17-50. There are the difference between normal or really good photos. Mine is not bad at all. In fact it is better built than the kit lenses and my Nikon 70-300 VR. As you pointed out the colors are amazing. This is for me one of the best value for APS-C available today. I am a retired mechanical engineer, and owned only pro grade Nikon lenses in the 1970’s and never hit or dropped any of them neither my Nikon F2, so for me paying a high prime for rugged construction is not required. 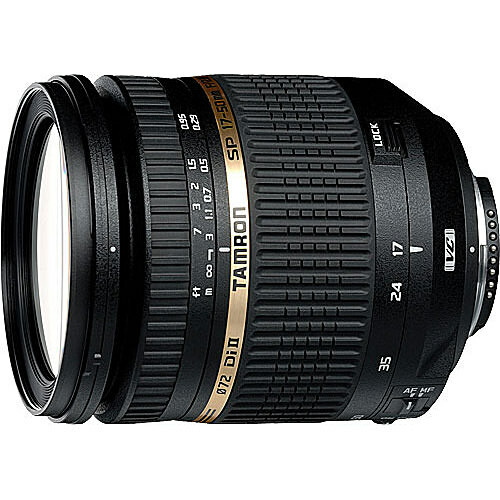 The Tamron 17-50 f2.8 if used for non professionnal applications appears to be a great buy even if it is not a Nikon lense. The autofocus on mine is slightly noisier and slower than on my kit lenses, but optically much better and brighter F2.8. Photozone.de is a german site and german people recognized mechanical quality when they see it, and they have given it a 3/5 which is not bad at all. I have read a few people not satisfied by Tamron service, because when asking for service, they tried to avoid repairing under warranty by blaming the owner of having dropped and damaged the lense, when the owner claim he never did. I have mine Tamron 17-50mm f2.8 for 2 years, and I dont find any problem with it yet. It costs me only 280USD. I just bought one this afternoon (non VC) and I am amazed at the quality of pics I took this sunny late afternoon on my D7000. I added an inexpensive Cokin P- Series ND Grad Filter kit. The skies are wonderfull with the ND filter . This ND kit received a five stars rating in a british photographic site. I am surprised of a total lack of any color fringes (blueish cast) around tree branches as I see with my 18-105 mm 70-300 mm and my 35 f1.8G lenses, even after using lens corrections in LR or DXo. Best money spent so far. I processed the pics in LR4.3 and also in DXO optics standard vs 8, and in both they came out quite good.